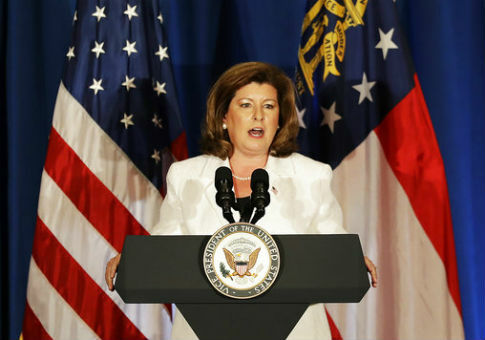 President Donald Trump took to Twitter Monday to urge Georgia's sixth congressional district to vote for Karen Handel in the special election that will be held Tuesday. The Atlanta suburbs will be voting to fill the spot formerly held by Secretary of Health and Human Services Tom Price with either Democrat Jon Ossoff or Republican Karen Handel. Trump endorsed Handel by tweeting that Democrats want to "stop tax cuts, good healthcare, and Border Security." He also pointed out that premiums under Affordable Care Act would only increase. The special election has garnered much of the media's attention because a win in the typically Republican district would bolster Democrats vying to win back the House. Democrats believe that Trump's low approval ratings will help Ossoff win, according to USA Today. Trump initially got involved in the special election by recording a robocall that went out to voters in that district. "If you don't vote tomorrow, Ossoff will raise your taxes, destroy your health care, and flood our country with illegal immigrants," Trump said in the call. This entry was posted in Uncategorized and tagged Georgia, Jon Ossoff, Tom Price, Twitter. Bookmark the permalink.